The Mao suit dominated fashion during the Cultural Revolution in China (1965-1968) not because it was a “fashionable” outfit, but rather because of its denotation of support for Mao and his ideals. Mao’s Cultural Revolution was motivated by a “power struggle” towards the top of the party system. However, although Mao established The Great Leap Forward, the movement was powered by the massive amount of students and young adults supporting Mao’s ideas. When the Cultural Revolution was still just a thought, a group of students openly denounced their school administration for repressing the students’ voice in a letter to Mao, later labeling themselves as “the Red Guards of Mao Zedong Thought”. This established the term “Red Guard” which is greatly affiliated with the Mao suit. Not long after, the Mao suit became the uniform and fashion that defined the Red Guards. The reason many of Mao’s supporters were young is because young people were intrigued by the freedom they were given by joining the Red Guard. Not only that, but also younger citizens were more likely to follow their friends and fellow classmates in fear of being left out of this trend. And with the Mao suit being the dress and uniform of the Red Guard, the Mao suit in fashion spread across China like wildfire. In the photo above, a train full of young citizens is on its way to the country side as a part of Mao’s Cultural revolution. 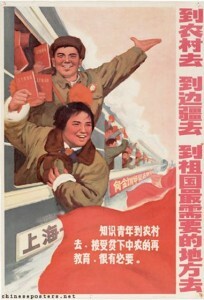 The viewer’s eye is immediately drawn to the two young adults with their smiling faces out the train windows holding their Mao red books with joy. Both young adults are wearing a Mao suit, however, the young adult on the bottom has white cuffs (possibly fur) and a fur collar on his or her Mao suit. Whereas the young adult above doesn’t have these features on their Mao suit. There seems to be a hair tie in the young adult’s on the bottom hair, which may indicate that this young adult is actually a girl. what do those visual denotations reflect? In contrast with Chinese fashion in previous years, the Mao suit was gender neutral. The Mao suit was worn by Women the same way it was worn by Men. This made it hard to differentiate boys from girls, but it shows the underlying idea of Mao that every citizen is equal and is merely just a part of a bigger social/working system. The fact that you can’t tell what gender either of them are for sure shows that the Mao suit was truly gender neutral. Further proving that Mao’s Cultural Revolution was in fact not about individuals, but rather about the larger population as a whole. The smiles on their faces in addition to the red books they are holding displays the blind support that young adults had in Mao Zedong as their leader. The color red is also very dominant in this photo but also in many other photos as well. This entry was posted in Fashion and Gender in China on March 30, 2016 by ejiu. 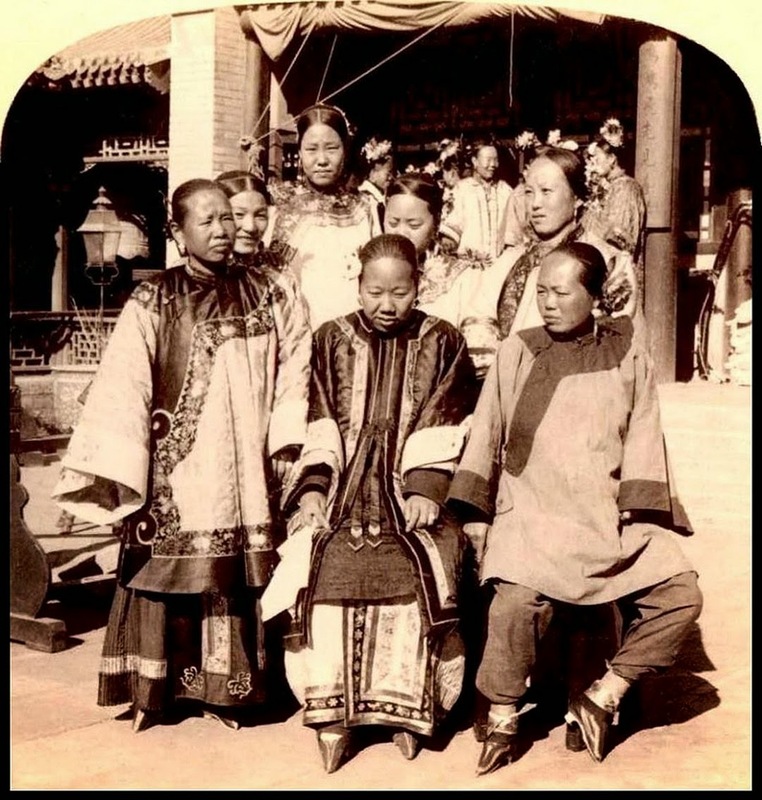 The Chinese Qipao as the standard wear for chinese women in the early 17th century was a more conservative dress than the Qipao after it’s resurfacing in the early 1990’s. The original Qipao sported a wide, baggy, and loose fit which ended up covering most of the female body. It’s baggy feature cocealed the figure of the wearer regardless of size and age. 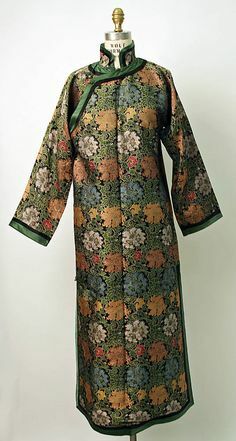 The Qipao was worn by women for everyday occasions, however after 1644, the Qipao was no longer required to be worn by all. But, in the 300 years following, the Qipao was ultimately adopted and tailored to suit the entire population. The modern Qipao was established in Shanghai in the early 1900’s. It’s fit was slim and tight with a higher leg cut then the original Qipao. 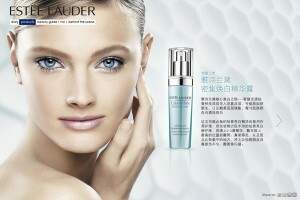 Because of it’s slimmer fit, the modernized Qipao highlighted the figure of women. The modern Qipao was brought back to light mainly by politicians, entertainment figures, and fashion idols. 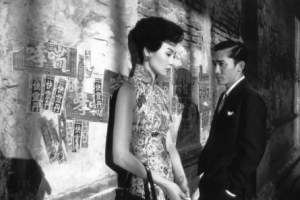 the modern Qipao was a sign of high society. furthermore, because the modern Qipao accentuated the figure of the female body, it became a sign for sexuality and femininity, similar the the concealed Golden Lotus. The photo on the left displays a Qipao from the 1930s. This Qipao is fashioned like the original Qipao was. As you can see the sleeves are long and baggy. The dress itself is also long and baggy going down to just above the ankle. The high neck piece conceals the women’s neck. The old-fashioned Qipao was a lot less constricting then previous garbs, which is the reasoning behind the baggy look. The embroidery on the Qipao is also well illustrated. It’s detailed in flowers and other greenery all over the Qipao. This well detailed embroidery is what catches the eye first. The photo below displays a modern Qipao dress. This Qipao is form fitting, highlighting the woman’s physique. The neck piece is not as high as the original and reveals the woman’s upper neck. The Qipao’s length has been cut to show the lower half of the woman’s thigh. A slit was also added on the sides of the dress showing only a slight part of her upper thigh. The sleeves are cut short, showing most of the woman’s arm. Although the design on the modern Qipao is beautiful, it is not the main focus of the dress like the embroidery of the traditional Qipao was. Overall, the modern Qipao is centered around the woman’s slender physique, bringing forward her sexuality. nice, but explain what are the social, cultural, historical, or gender connotations that the transition of qipao style suggests? This entry was posted in The Modern - Qipao on February 23, 2016 by ejiu.